When you choose to read Flipster magazines on your mobile device's browser, issues open in the mobile version of the viewer. From the Home Screen, enter your search terms in the Find field and click Search. 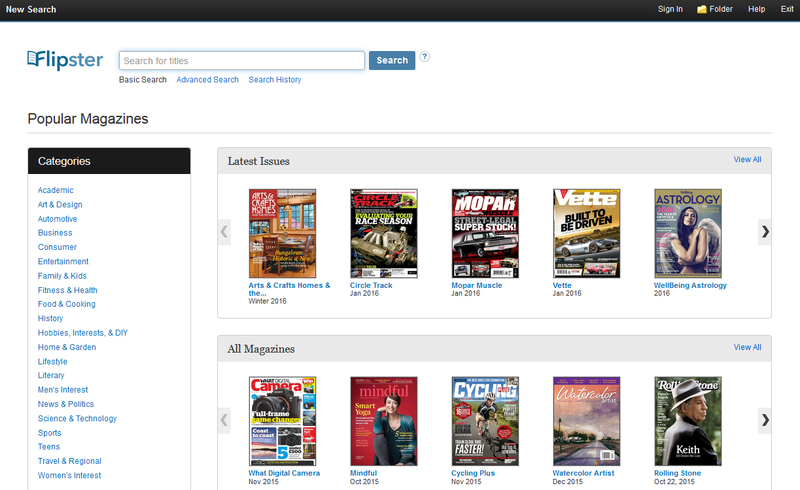 A Result List of magazines that match your search is displayed. Click on a title or the Read This Issue link to read it in the Flipster viewer. Search the current issue vs all issues. Search for all content vs articles only. All Issues: Hover your pointer over All Issues to access all available issues of your title as well as the Table of Contents for the current issue. Pages: Hover your pointer over Pages to view visualizations of all pages available in the current issue. Click on an image to go directly to that page. Zoom: Click the Plus or Minus buttons to zoom in and out of the page you are viewing. Page Arrows: Use the forward and back arrows to page through the current issue. Print: Click the Print button to open a PDF version of the pages you are currently viewing, which you can then print on your computer. Show one page at a time: Select to view only one page at a time. Zoom out on page change: Select to zoom out to the full page view every time you move to another page. Fit: Select to fit the page in the viewer by height, width, or height & width.